2. 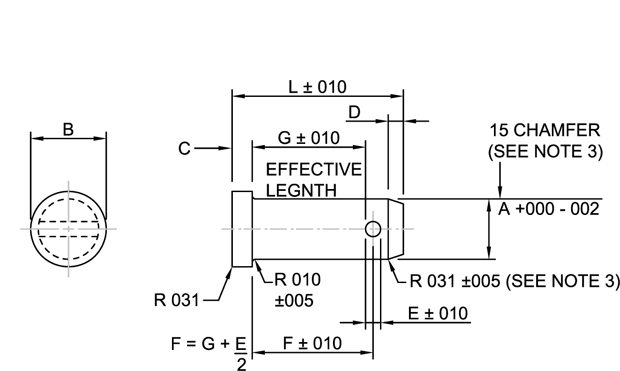 Unless otherwise specified, tolerances on decimals shall be +-016 and on angles shall be +-1/2°. 7. UNS 87400 (AISI 8740) steel alloy can be used in the manufacturer of “C” or “S” clevis pins at the discretion of the manufacturer/supplier. However the “S” clevis pins shall be heat treated to enable the pins to have the required double shear strength. 8. MS20392 supersedes AN392, AN393, AN394, AN395, AN396, AN400, AN402, AN404, and AN406.